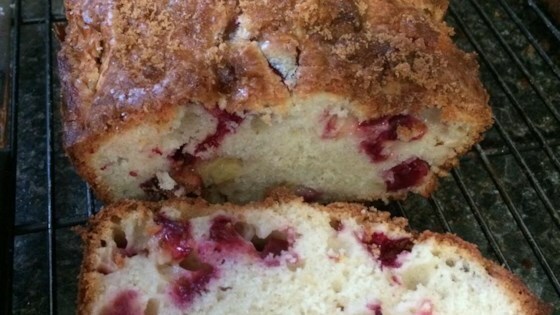 "A cross between a cake and a loaf bread, with sweet-tart plums and a brown sugar topping. Just like my mother-in-law used to make. Use plain, lemon, or orange yogurt." Preheat oven to 350 degrees F (175 degrees C). Spray a 9x5-inch loaf pan with cooking spray, or line with parchment paper. Sprinkle chopped plums with 1 tablespoon of flour in a bowl, and toss to coat. Set aside. In a large bowl, beat the margarine, white sugar, and vanilla extract with an electric mixer until light and fluffy. Beat in the eggs. In another bowl, sift together 1 1/2 cup of flour with salt and baking soda. Stir the dry ingredients into the egg mixture, alternating with yogurt until the mixture forms a smooth batter. Lightly stir in the flour-coated plums, and pour the batter into the prepared loaf pan. Sprinkle the top of the batter with brown sugar. Bake in the preheated oven until a toothpick inserted into the center of the loaf comes out clean, 45 to 50 minutes. Remove from oven, and let cool in the pan 10 to 15 minutes before removing from pan for slicing. Yum! Made two loaves and froze one. Just as good from the freezer as from the oven and is great when toasted. Delicious,moist,thick batter holds fruit evenly.